companies to configure and define their own audits and audit items. Familiar spread sheet style interface enables ease-of-adoption. are tracked and monitored for future failures. 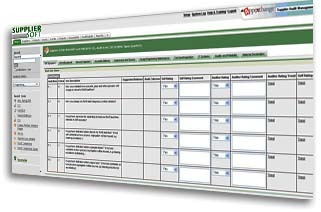 historical audit data across global suppliers and supplier sites..
Configurable audit approvals: Dynamic approval routings provide you full flexibility in defining the approval process for an audit. the level of information access for auditors. Expiration driven reminders: Expiration driven reminders ensure that audits and corrective actions are completed in a timely fashion. on suppliers and auditors is the foundation for managing audits. reminders ensure that the contacts stay accurate. information, reducing the need to train suppliers on the system.